It’s easy for a weekly night out to add up and make a large dent in the monthly money you have available to spend. On an average night out it’s not hard to spend upwards of £50. If you’re planning on having some food, a few drinks and a dance and then getting a taxi home you’re looking at considerably more. When you’re saving money, nights out may be the first on the list of things that have to go. However, don’t give up going out so easily. In this article we’ll look at how to have fun on a budget and at some ideas for cheap nights out. Money saving on nights out is all about a little creativity and forward planning. 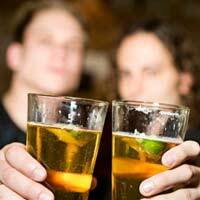 For many, often the most expensive part of a night out is drinking alcohol. The obvious solution for saving money on a night out is to cut the booze out altogether or at least cut down. You could volunteer yourself as the designated driver and you’ll save money on getting home as well. If you’d still like to have a drink or two, try setting yourself a limit that fits in with your budget or alternating alcoholic drinks with soft ones. Another way for saving money, but one which is admittedly student like, is to have a few drinks at home and then drink very little once you actually go out. One other way to ensure cheaper nights out is to avoid buying drinks in rounds. You can’t control how much money you’re spending when you buy in rounds. Therefore it’s best to just explain to the group that you’re skint or that you’d rather just get your drinks separately. Most people will understand. More than ever given the current economic climate, businesses are offering incentives to get customers through the doors. There are loads of cheap restaurant deals around as well as other discounts and offers. For example Orange Wednesdays offer a cheap opportunity to go to the cinema. Look out for money saving vouchers in newspapers and magazines as well as on dedicated coupon websites. Obviously if you’re out on a Friday or Saturday night after seven it’s peak time and you’ll pay premium prices. However, the rest of the time businesses often offer money saving promotions to attract customers. Look out for happy hours, weekday deals and daytime specials. If you want to eat out, consider lunchtime instead of the evening as there are often really good lunch deals. Not strictly a cheap night out, but still a great way of saving money. Getting taxis everywhere can cost an absolute fortune. If a taxi is the only way to get home try to make sure there are as many people in it as possible to spread the cost. If possible, get public transport home as the cheapest option, but only do this if it’s safe to do so. If a taxi alone is your only option keep the taxi money aside out of your budget and don’t be tempted to break into it. When it comes to getting home, even when you’re trying to have a cheap night out, consider your safety first. It is not worth risking your safety and walking home alone in order to save a bit of money.